This 20V Max Grease Gun contains a powerful motor that delivers 10,000 max psi to power through clogged grease fittings. 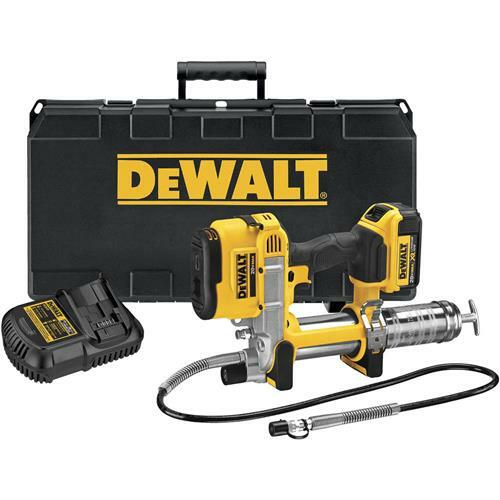 High-volume pump pushes up to 5.0 oz/min high-flow applications and goes through up to 16 cartridges per charge on a single DeWalt battery. Variable speed trigger offers precise control of the grease flow and 42" extra-long and flexible hose designed for reaching hard to access grease fittings. Bright LED light assists in locating hard to see grease fittings in low-light situations and innovative pump filter screen prevents dirt and contamination from clogging the pump mechanism. Integrated no-mar foot design allows operators to rest the tool on flat surfaces and air-bleeder valve assists in pump priming after cartridge changes. Includes grease gun, one 20V MAX XR Premium Li-Ion Battery (4.0 Ah), fast charger, shoulder strap, and kit box.